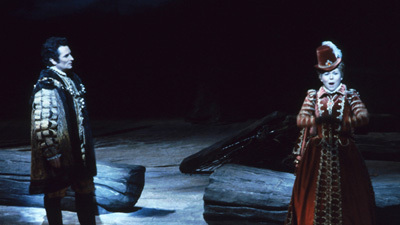 Don Carlo (Richard Tucker) is a man on the edge with seemingly nowhere to turn: the fiancée he loves, the French princess Elisabeth de Valois (Delia Rigal), has been forced into marrying his own father, Spain’s King Philip II (Jerome Hines). His closest friend, Rodrigo (Paolo Silveri), seems to be playing a dangerous game with the King. Princess Eboli (Fedora Barbieri), a proud aristocrat, is herself in love with Carlo. And always lurking in the background is the crafty Grand Inquisitor (the great Hans Hotter), who has his own agenda. Fritz Stiedry conducts Verdi’s masterful score.